Update: The teacher has been identified and charges are forthcoming. Being a University of Kentucky fan in another SEC occupied state can be frustrating, especially during football season. For starters, I have to hear about it every time our team annually gets stomped by the University of South Carolina Gamecocks. To make matters worse, I predictably acted like a complete jackass the one time we were able to miraculously beat them in 2009, ensuring that my friends will always be on the ball when it comes to giving me grief over our gridiron disparity. Even more enraging is the fact that when Kentucky predictably beats the Gamecocks at basketball every year (an event I very much enjoy getting to watch in person), everyone conveniently forgets that there was a game the night before or (like a true die hard fan of a university) claims that they "don't follow the basketball team"...except for the one year when they miraculously beat us. Then they all seemed to be a long time Gamecock basketball fans. But I digress...my complaints are typical of someone living in a different state from which their team is from, particularly if it's an in-conference rival. But nowhere is this situation worse than for those of us who teach in a public school. For starters, you receive the standard malice and taunting from others that occurs when your team loses to an in state rival, but it is being delivered by people who in many cases have been potty-trained for less than a decade. 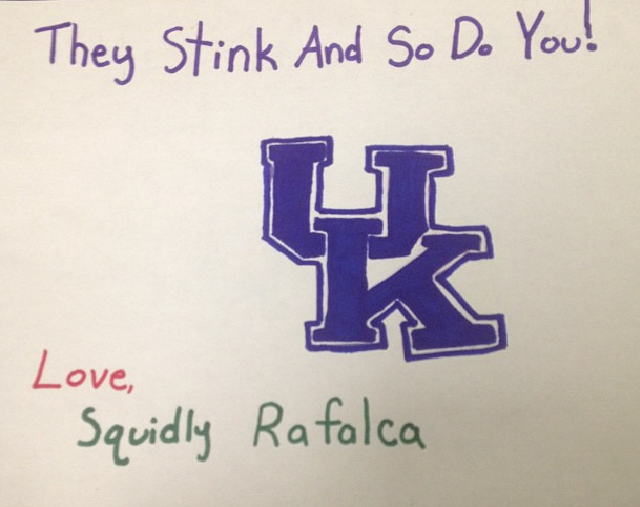 Even the kids who you like a lot will find ways to lovingly torment you about your team's failures. What really kills me: Kate/Squidly actually did a nice job with the logo. The kids you don't like will almost always be bandwagon fans with relatives that mysteriously move from city to city of whomever wins their league's championship (and sends them clothing proclaiming it). But even they can manage to get under your skin because since they're kids, there's not much you can say back. I mean sure, you can point out that they're not real fans or that they really shouldn't refer to a school as "we" when they are at least 8 years from possibly attending that institution and just failed a quiz last period, but it really doesn't have any effect...and is also incredibly petty. They are just kids, after all. There are lot worse things they could do than ribbing you about your team losing the way anyone else would do. That's why I was more than a little shocked after reading a story yesterday about a middle school teacher who beat the crap out of a kid for making fun of his favorite football team. On November 8, 2013, 12-year old Reginald Wells, who weighs all of 80 lbs., walked up a teacher (who for some reason is not being identified in any of the incident reports) and made a joke about his favorite football team. This is a situation I've often found myself in, particularly this year since I'm an Atlanta Falcons fan, as well. But rather than brushing it off, the teacher proceeded to punch Reginald in the shoulder. As you might imagine, Reginald was a bit taken aback. He responded by pushing the teacher in the shoulder, which while being completely understandable (and deserved), was a very ill-advised course of action. The teacher allegedly retaliated with two hard jabs followed by an uppercut that knocked Reginald out and sent him sliding across the floor. The teacher was fired on the spot and escorted off the premises. While leaving the campus, he further cemented his status as a complete and utter douchebag by saying that he "couldn't apologize" for what he did and blaming it on simply having had a bad day. He was also not arrested, which absolutely blows my mind since this was a pretty clear cut case of assault. Now I know that a lot of you are probably wondering if there is more to this story than we are getting. But while that may be the case, there are a couple of things to keep in mind. 1. Embedded below is an interview Reginald and his mother gave to 12News in Texas. You don't get the sense at all that this kid is particularly mean or antagonistic. 2. And even if the student was acting like a little punk, IT'S A FREAKING 12-YEAR-OLD KID! Good lord man...he insulted your football team, not your mother (who is probably the opposite of proud to have given birth to you at the moment). ...and speaking of "your football team,"
3. Who the heck is this guy's team? None of the reports so far have stated who it was. 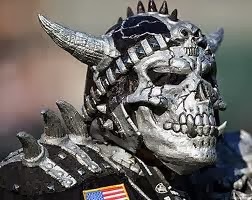 I know I made the joke about the Raiders in the headline, but it really could be anyone. The mom in the interview was wearing a Cowboys shirt, so I'd put early money on the Redskins (who I'm guessing would not appreciate getting anymore bad PR right now). I'm sure we'll eventually get to find out Mr. McPunchy's favorite team when charges are inevitably filed. But until then, not knowing which NFL franchise currently has the world's most terrible fan is killing me. For now, however, let's just be glad that this guy is no longer in a classroom with students. ...or that he's a Kentucky football fan. To get updates on when new articles or podcasts are published (and occasional random musings) 'Like' the official RamblingBeachCat.com Facebook page. Every time someone does, a teacher decides that the best way to deal with a student making fun of his team is to forget about it and go get a Snickers out of the vending machine.